Growing up in a home that has nothing but love for dogs, we have come to appreciate the fact that dogs, like humans, have almost similar needs. We all want to be comfortable, especially when the soaring temperatures put our health at risk. So, in summer, the need for a pool to cool off is invaluable, especially for dogs because of their thick coats. The need is increased by the fact that there aren’t many community pools that allow dogs in; hence our search for the best dog pool. Our team took many hours to search for this pool. And after the search and tests on some of the pools, while also considering the feedback of other dog owners, we have a list of the best pools for dogs. Why should I buy a dog’s swimming pool? If you are looking for a large dog pool that will accommodate all dog sizes, you might want to try this FrontPet Foldable Bathing Tub, a 12 inch by 50-inch pool that holds larger dog breeds like Labradors, as well as any small dog comfortably. Because of the large size, you could fit in the pool too, and so it works well as a mini-pool. The size also makes it a great bathing tub for your dogs. Although you may want to put a tarp or even a blanket under the pool when placed on a hard surface, it’s rather durable thanks to the strong PVC material that doesn’t puncture or rip. So, unless you are placing it on sharp objects, this reasonably priced pool will last a long time, giving you value for your money. No inflation required for use. Its drain plug makes sure it drains fast, and the paneled segmented sides fold up easily for transportation or storage. The construction of this Cool Pup Splash pool with sturdy and thick walled/ lined PVC and the large 12-inches by 64-inches size with a capacity of 119.25 gallons of water make this the ultimate portable large dog pool. The best bit is that nails will not rip the PVC material and it will also withstand chewing to a small degree. The only issue is that it must have water to stand upright. Its portable and collapsible/ fold-down design make this an easy-to-use dog pool you can use anywhere. It doesn’t take up too much space when filled up and when not in use, you don’t have to worry about its storage space. The PVC material is easy to clean after use, and the drain plug makes it easy to drain and pack it up after your pooch gets its fill of fun. 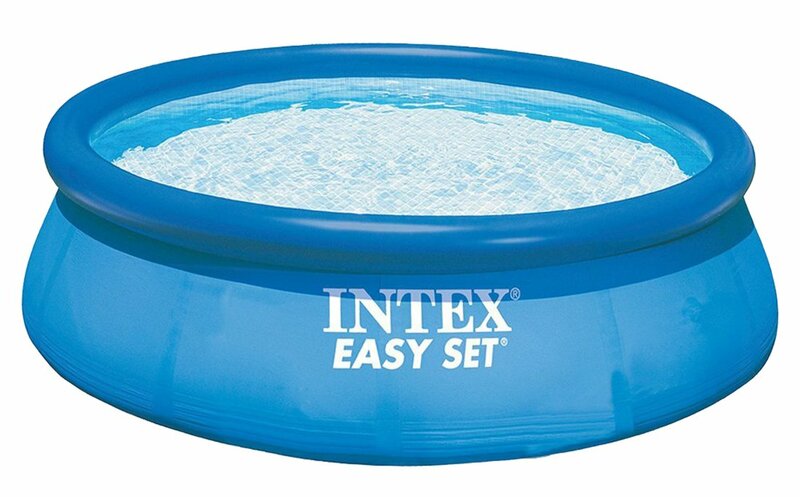 If you are looking for a small pool that is safe for those tiny pups or even a child and medium-sized dogs, this Intex Easy Filter pool could be exactly what you need. Priced reasonably, this pool is uniquely designed with a 110-120V filter pump that pumps 530 gallons of water hourly and is easy to install. Installation is as easy as hooking up the hoses, and in only 10 minutes, your pup can get in. Don’t forget to inflate the top ring and always lay it out on level ground. Once done, use the conveniently located drain plug connected to a garden hose to drain away water. The filtration system aerates the water, and by oxidizing iron and manganese in water, your dog gets to swim in clear water that makes playing even more fun. The super-tough and laminated PVC sidewalls of this 12 by 30-inch pool will give you value for your money. You shouldn’t, however, set up this pool on mud, sand, or any loose/ soft soil. This is one of the lowest-priced pools for large dogs, and you could also use it as a bathtub, an outdoor pool, a baby bath, or a fish pond. 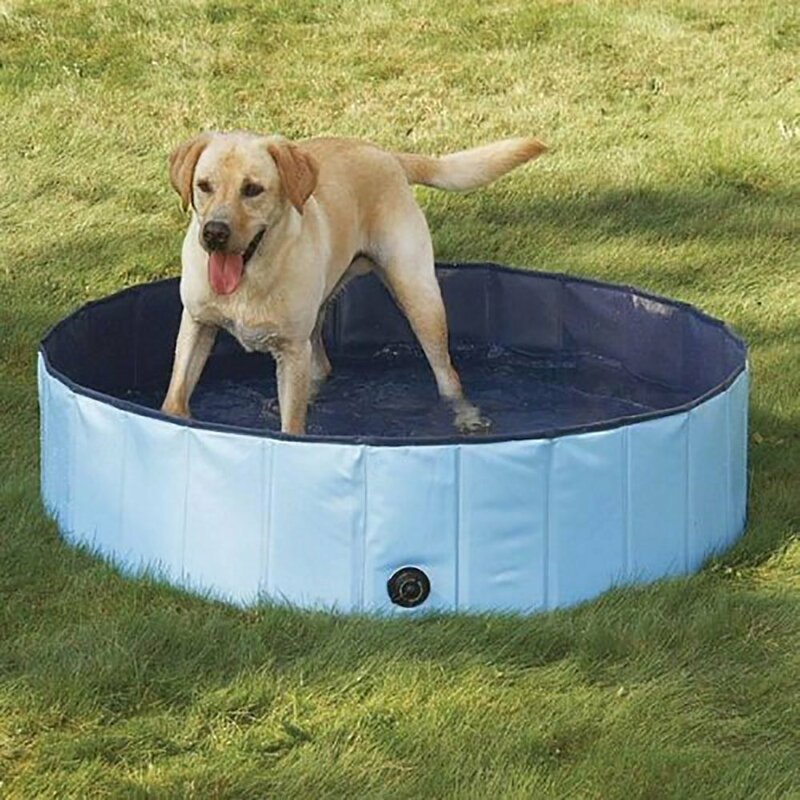 With its dimensions of 11.8 by 47.3 inches, this dog pool is suitable for medium and some of the large dogs as it has enough space to allow the dogs to splash in easily. It is an eco-friendly pool made of PVC. The small size makes it easily foldable after you open the pine oil drain plug to drain the pool water. You can store it easily in the zippered bag that comes with the pool. Even though claws and nails will not scratch and tear it apart, you should place a tarp or a blanket at the bottom when using the pool on a hard surface to ensure that it lasts longer. No need to inflate it for use. The glowing reviews for this pool mean that it is a worthy investment for any large dog owner. The combination of resilience and portability make this a great investment to any dog owner. Priced competitively, this is an appropriate pool for small dogs. Even with long nails, your small dog will not puncture the pool thanks to the 100 percent PVC construction. It’s easy to set up, and all you need to do is to fill it up with water – no inflation necessary. Its drain plug takes the hassle out draining. It folds up easily for simple storage and transportation. 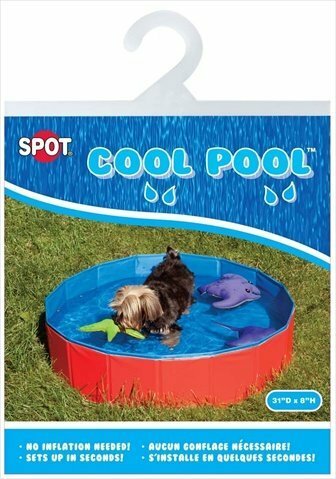 This Ethical Spot DSO1003 Dog Pool stands on its own without water, and the tough construction material gives you value for your money. It will withstand claws and nails effortlessly. Wouldn’t you like to spend less time setting up a pool in the hot sun for your dog when the heat wave hits? 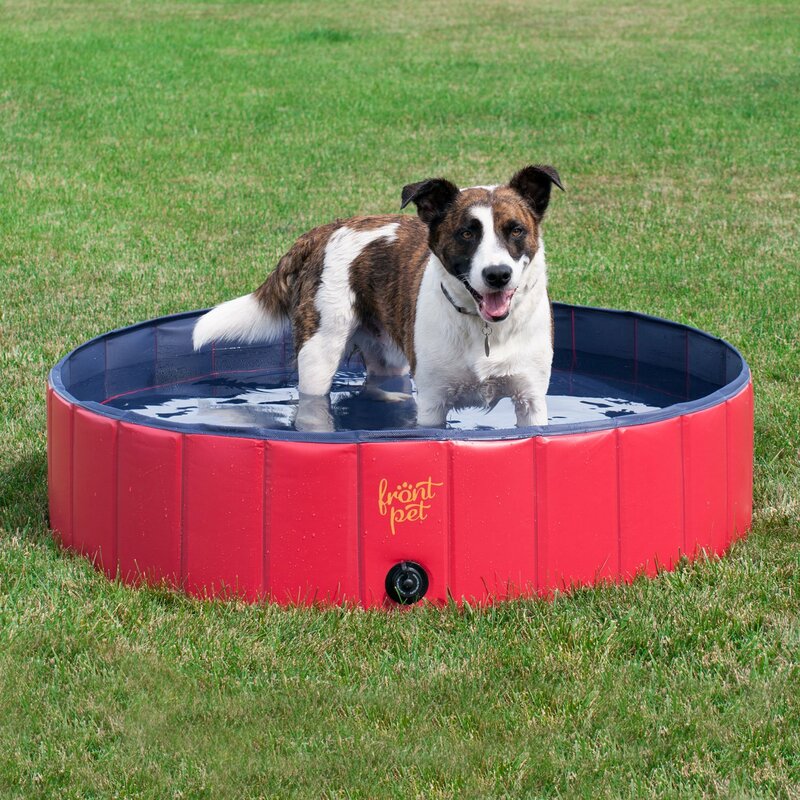 How about a pop-up pool like this Petsfit 41″ Foldable and Portable Pet Swimming Pool? This product is lauded as one of the most durable pet pools on the market, with the best bit being the fact that the pool will withstand pressure even from the most playful small or medium-sized dogs. Its high suture quality enhances its durability. 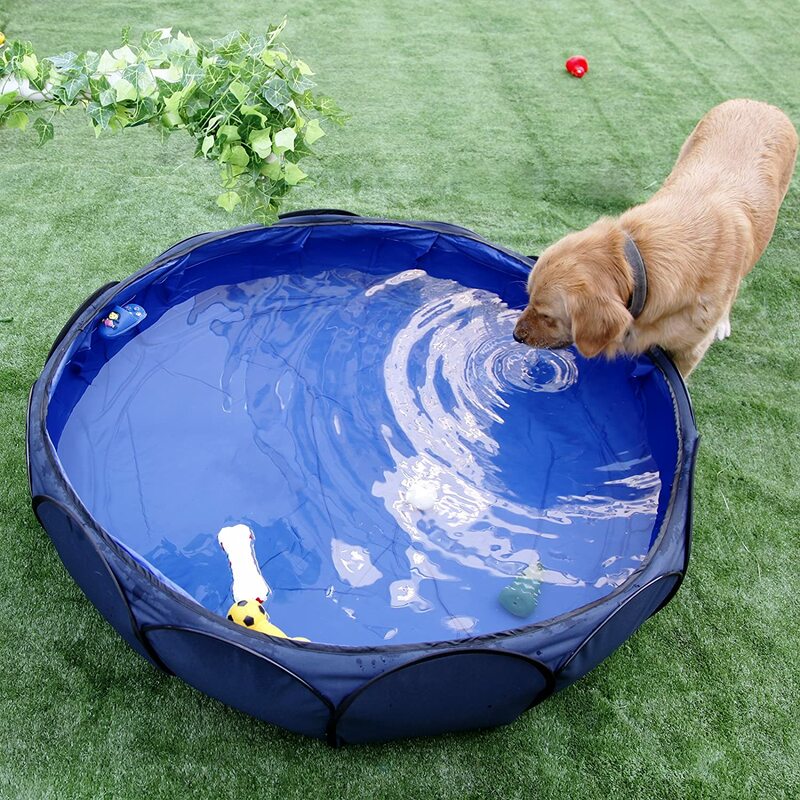 Measuring 12 inches deep by 41 inches in diameter, this pool is ideal for most medium and small dogs. Your large dog could also fit in it but, he or she will not get enough space to splash and turn around. Taking the size into consideration, this pool will work well as a bathtub if you need it for a large dog. The segmented sides pop into place when needed for use – no inflation necessary – and its interiors are lined with tough and heavy-duty PVC material that will not get punctured by nails. Unfortunately, many people are avoiding this pool because it does not come with a drain plug meaning you must tip it over when emptying it. The absence of a drain notwithstanding, this pool is foldable hence effortless storage. You know how they say that sometimes you have to pay a bit more money to get a product that lasts long and one that it worth your money? This One Dog One Bone Dog Pool is an example of such exceptional products, and your dog deserves it. Wondering why it has a high price tag? First, the bone-shape appeals to dogs. Secondly, its durably designed with durable and heavy-duty material as that of a truck bed’s liner. Its construction material is chew-resistant and UV-resistant meaning that it is the best pool for chewers, diggers, and also you can leave it out in the sun for some time without having to worry about it fading. You also get to place it on gravel and other hard surfaces without worrying out breaking or punctures. Its brass cap drain is durable and easy to use, and it makes draining of the pool easy. It holds 85 gallons of water and measures 11inches by 44 inches by 66 inches making this a befitting pool for medium, large, as well as the largest dogs. Other reviewers note that this pool is ideal for labs, bulldogs, and Shepard. You could place non-slip strips at the bottom, and though it lacks a water pump, it works great. Looking for an easy to use pet pool that will allow your medium-size dog to play and splash water around even as it learns to swim? 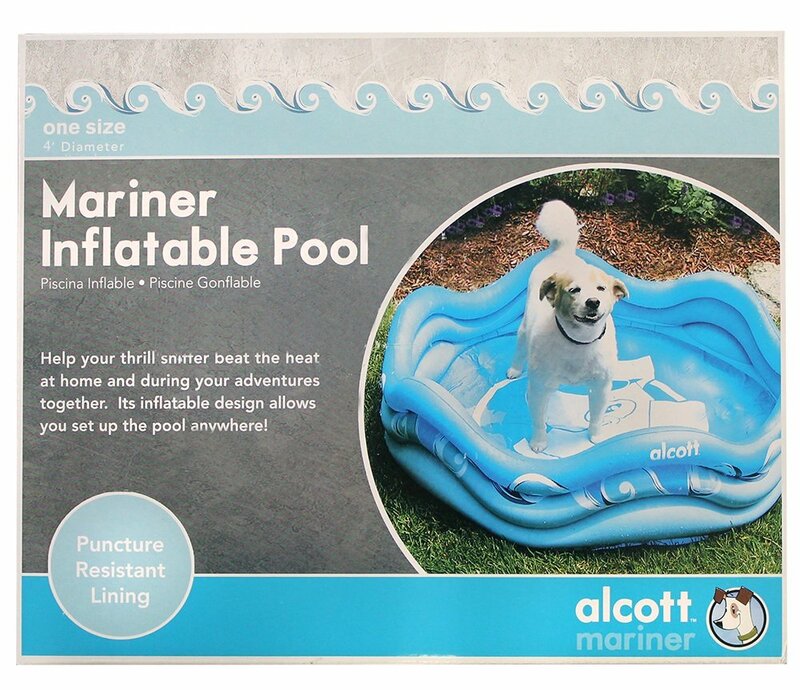 You might want to consider this Alcott Inflatable Pool that boasts scalloped edges, as well as low dips which make for easy entries and exits, especially for small dogs. It also has a plug which allows for easy draining. The 48-inch diameter and the depth of 16 inches make this an ideal pool for medium-size dogs. The pool’s design makes it easily foldable once you drain all the water and that means that you can carry it almost everywhere. It is also lightweight and weighs a mere 4lbs. It comes with a repair kit for fixing any small rips or punctures. 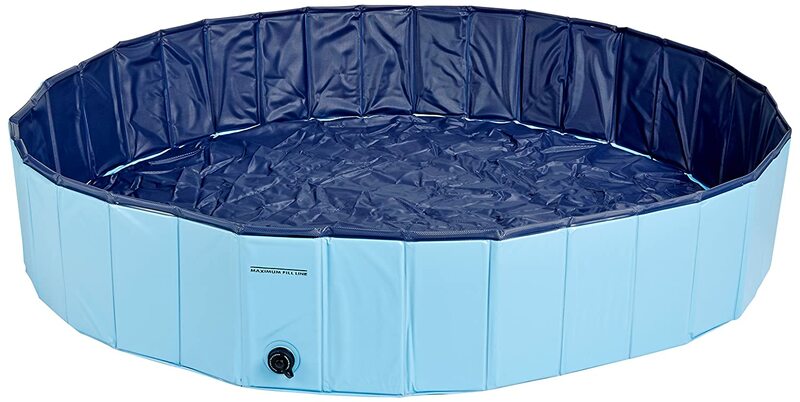 Note that this pool comes with three separate air bladders instead of the one bladder seen in most inflatable pools meaning that inflating this pool is a lot easier and even if one section is deflated/ punctured, the pool will remain standing. Made with heavy-duty liner material which flexes easily while making draining an effortless affair, this pool is one of the most durable pet pools; the best bit is the fact that the pool works well for small as well as large dogs that love splashing in the water. The tough plastic/ HMWPE construction, same construction as that of truck bed liners make sure that you get full value for your money. The construction also makes this pool chew resistant, and also resistant to UV radiation. Also, its tough construction makes this pool suitable for diggers. It measures 6 inches by 38 inches by 39 inches which means that it is small and the larger dogs will only lie in the water and maybe splash water around. But the smaller dogs will have the best experiences with this pool, especially because they won’t have to struggle to get in and draining the pool will be a breeze. You also won’t have to deal with drowning issues. You can use it even in the hottest summers thanks to the reflective quality of the color blue – absorbs less heat than a black pool and so it will keep the water cooler for longer. It is cheaper than the bone pool by almost half. It is fun. You may swim for health or weight reasons by don’t you reckon that sometimes you only need to go swimming for the fun of it? The same applies to dogs, and it is a safer, less destructive pass-time activity. If idle you know that you may find your house in a mess, right? Mental stimulation: dogs get bored pretty fast, and they hardly have much to do. To break the boredom, introduce water, a new stimulus that will keep your dog active and also busy. Protection from heat stroke: as the summertime temperatures soar, they will need to cool off. They have a thick coat and water will automatically cool them down. You might have to invest in cooling beds or vests too. Exercise: to lower the risk of obesity, you should give your dog an opportunity to swim. Make sure you get the right size of the pool. Swimming is a high-intensity but a low-impact type of physical activity. A step to bath time: you may not like bathing your pooch in the shower or bathtub, and that is okay. A pool is an excellent alternative, and it also prevents wet carpets or that wet-dog-smell. The only catch is that you have to be careful about how you intend to dispose of soap. It protects your dog from overheating or heat strokes in hot summer days. You should, however, ensure that you add clean water in the pool frequently, especially when the pool lacks a water filtration pump. The next best option to a dog swimming pool is hosing. Whether you are buying a pool for a pup or a large lab, you must ensure that the material used in its construction is of the highest quality and durable. Once in the pool, your calm and a gentle dog will be a different dog because it gets overexcited and he or she will get very physical once in the water. So, even if you are buying a plastic dog pool, ensure that it is a heavy-duty plastic that will hold the weight of the dog comfortably when playing. You also need to keep in mind that poor quality plastic may result in an accident and hurt your dog so, only go for the best. If made of PVC, ensure that the dog’s nails will not puncture the walls and the floor. Like you, your dog will not appreciate swimming in a small pool that he or she can barely turn or move a leg. So, choose the pool depending on the size of the dog at home. If you have a large dog that may grow a few inches in the next few months, buy the biggest doggie pool there is. Besides the diameter, check the depth to ensure that your dog will be able to swim well. Keep in mind that if the pool is small and feels like a tub, that is all it will be. The shape of the pool determines the pool’s ease of entry and exit. The best pool for dogs is easy to get into and out. For this, you also need to consider the size of the dog, especially if you want to give your dog a level of independence by getting into the water and getting out without help. When introducing your young puppy to the pool, you should be aware of wading because it could be fatal. So, start it off with only a few inches of water, increasing the quantity of water as your dog gets used to the sensations of water. Also, regarding safety, you should look at the materials used to make the pool. It should be UV resistant, chew resistant, have a non-slip floor, and it should not leach harmful chemicals into the water. The other safety feature is the pool’s filtration system. If you are unable to empty the pool after every swim for any reason or if your dog spends a lot of time in the water, it would be prudent to invest in a pool with a filter pump. That way, your dog won’t have to deal with infections, skin rashes, red eyes, and itching. Don’t forget to rinse off your dog after swimming.